Bank of Canada watching - what's up with the balance sheet? Normally this blog is just a comment aggregator, but once in a while I write a substantial post. Here’s one. As a bit of a Bank of Canada watcher, I recently noticed that the Bank of Canada’s balance sheet is undergoing some interesting changes. Firstly, on the liability side of its balance sheet, government deposits held at the Bank have been growing quite quickly and are now at their highest level since the credit crisis. On the asset side of its balance sheet, BoC assets are growing at over 15% year over year after relative slow growth for the last few years. Before exploring the reasons for these changes, as always I like to put the data into charts for context. 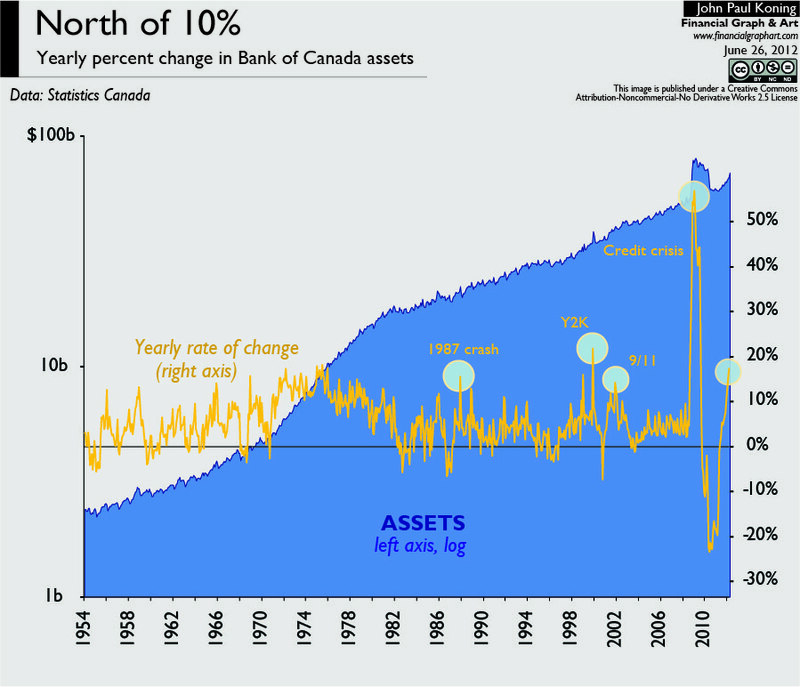 As my first chart entitled North of 10% shows, BoC assets have only grown this fast a few times over the last few decades, mostly during crisis points like Y2K and 9/11. Giddy stuff. The chart entitled Flight of the loon decomposes the growth of the BoC’s balance sheet into various components since 1981. If you look at the most recent twelve months, you’ll see what I mean about government deposits. Since last fall they have increased from under $1 billion to over $8 billion. On the asset side of the Bank’s balance sheet, this has been compensated by an increase in government bonds held by the Bank (the red bit). All of this pales in comparison to what happened during late 2008 and early 2009, of course. This older period deserves a revisit. (The next ten paragraphs or so digress from the main topic – why the BoC’s balance sheet is growing now – so skip them if you wish). In September 2008, as the Lehman crisis reverberated through the financial world, the Bank of Canada began to conduct large scale purchases of assets with Canadian private banks and other financial institutions. The securities purchased were comprised of federal and provincial debt, Canada Mortgage Bonds issued by the Canadian Housing Trust, NHA MBS, as well as straight corporate bonds and asset backed commercial paper. These assets are represented by the gray section of the assets part of the above chart. In making these purchases the Bank of Canada was flooding the banking system with its own liabilities, otherwise known as clearing balances. The latter are accounts held at Bank by the commercial banks, and represent an obligation of the Bank of Canada. In our chart, these accounts are referred to as CPA deposits, where CPA refers to Canadian Payments Association. All large banks are members of the CPA and maintain clearing accounts at the Bank of Canada. This flood of balances would have threatened to send Canadian overnight lending rates plunging below their targets if they weren't simultaneously canceled out by equal and opposite transactions. This sort of central bank action is called “sterilization” in monetary economic lingo. Looking at the chart, it is evident that the BoC sterilized their large scale purchases as there was no large increase in CPA deposits outstanding on the liability side of the Bank’s balance sheet, nor did overnight rates collapse. Instead, there was a large increase in government deposits. What happened here? Well, it’s not entirely clear. In all my Googling I haven’t found a single explanation by the Bank on how this was achieved. However, as happened with the Fed, from mid October on, the Bank of Canada started to follow a different approach in its efforts to provide more liquidity to term credit markets. 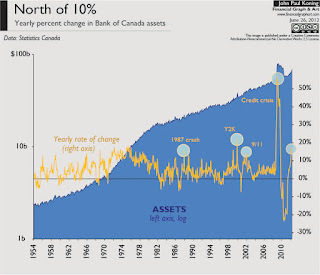 From then on, the size of the balance sheet of the Bank of Canada grew very quickly, as the Bank was acquiring treasury bills newly issued by the Government of Canada, providing the Canadian government with deposits at the Bank in return. The acquired treasury bills were then sold in turn to the banks as a way to neutralize the effects of the liquidity-creating term repo operations. In so doing, the Bank managed to keep its stock of treasury bills at an approximately constant level, while the size of its balance sheet grew by the sum of the granted term advances and term PRAs. If you just skipped through rather than reading the above comment, here is a brief summary. According to the authors, the Bank of Canada sterilized the large scale purchases by purchasing t-bills directly from the Federal government, then selling these bills to private financial institutions. In this way the excess clearing balances that had been created by the BoC’s large scale asset purchases were canceled as those balances were used by financial institutions to buy up t-bills from the Bank. Having directly bought fresh t-bills from the Federal government, the Bank of Canada now maintained a much larger deposit account on behalf of the Federal government. By not spending its deposits held at the Bank, the Federal government effectively kept these balances out of the financial system and ensured that the operation remained sterilized. I’m not sure how much of the above is Lavoie and Seccareccia’s perception of events and how much is based on documented Bank of Canada descriptions of events. I haven't been able to confirm the former with the latter. If we are going on hunches, I think the sterilization probably happened in a different manner. Private financial institutions began to buy up new t-bills issued by the Federal government in earnest beginning in September 2008 at the same time that the Bank of Canada began its large scale purchases. 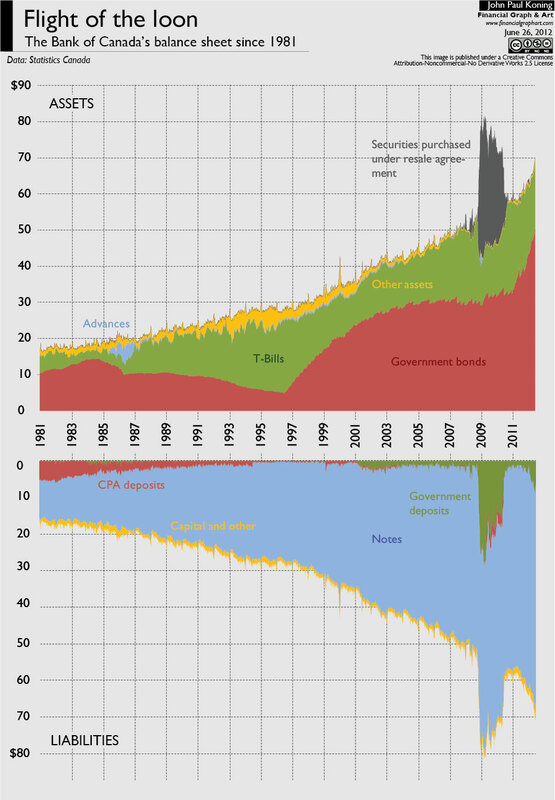 These t-bill purchases meant the government now held significant quantities of deposits in the private banking system. By transferring those deposits from the private banking system to the Bank of Canada, the Federal government could neutralize the effects of the BoC's large scale purchases. The excess quantity of clearing deposits created by the latter were effectively converted into government deposits, removing the excess. This is the old “drawdowns and redeposits" mechanism, nowadays referred to as the Receiver General cash balance auction. Through a twice daily auction, the RG determines what portion of the government's short term deposits should be allocated to the private banking system and what part should stay in the Bank, and the rate it will receive from private banks on those deposits. Anyways, both Lavoie/Seccareccia route and mine lead to the final resting place. And both their mechanism and mine might have been simultaneously in effect, as well. But I still think the majority of the sterilization would have come from Receiver General auctions. Why? We know that the BoC’s asset purchases increased in size from zero to over $38 billion by the end of December. If Lavoie and Seccareccia are right that the sterilization of these purchases occured via BoC sales of t-bills, then it would have been necessary for the Bank to auction off some $38 billion in t-bills. But over that same time frame the Bank announced auctions worth only $15.8 billion worth of t-bills. Much of this would have been from its existing stock of t-bills. Because Lavoie and Seccareccia can’t account for the majority of t-bill sales that would be necessary to fully sterilize the $38 billion in large scale purchases, the only mechanism available to fill the gap are Receiver General auctions of government deposits. There may have been some direct purchases of t-bills from the government in order to resell them to the banking system, but not as much as the above authors seem to beleive. But I'm open to being convinced otherwise. Government deposits at the Bank of Canada have been rising over the last twelve months for much more banal reasons than crisis like Y2K or 9/11. The recent expansion in the Bank of Canada’s balance sheet is largely due to the debut of this prudential liquidity plan. Government deposits at the Bank, which spent most of 2011 between $1 and $2 billion, began to steadily rise last October and now clock in at $8.5 billion. These deposits have been growing as a result of increased direct purchases of government debt by the Bank of Canada. Typically, the Bank buys a minimum percentage of the amount of bonds being auctioned in government debt auctions. On October 19, 2011, the Bank announced that it would be raising its allocation from 15% to 20%. As a result of its more aggressive purchasing commitment, Bank of Canada holdings of Government of Canada bonds have grown from $40 to $50 billion in just a few months. By 2014, the amount of government deposits at the Bank should have increased to around $22 billion ($20 billion to satisfy the requirements of the prudential liquidity plan, and another $2 billion or so for normal operating balances). Bank of Canada assets, mostly government bonds, will have increased by that same amount. A few scattered questions and comments before I sign off. US readers will notice that for better or for worse, the Bank of Canada can do something the Fed cannot - buy government debt directly from the executive branch of the government. The Federal government evidently feels it needs to build up a cushion to safeguard its ability to meet obligations should funding markets freeze up. But if the Bank of Canada can simply increase the amount of government debt it purchases at auctions, one wonders why the government feels that it need ever worry about liquidity to begin with. I think the answer is somewhere along the lines of... markets don't mind if you monetize government debt in good times, it might be taken poorly during difficult times. So better to do it now. At some point, the government may spend those deposits. Does the Bank have a plan in place to ensure that the government can spend them without influencing the overnight rate and therefore the ability of the Bank to target inflation? For instance, in a liquidity event in which the government has troubles issuing debt to the market, it will have to spend down its deposits at the Bank of Canada. But the Bank will have to simultaneously sell bonds in its portfolio in order to sterilize the government's spending. If it doesn't, there will be an excess position in LVTS and the overnight rate will fall below its target. How easily, both technically and politically, will it be to sell government bonds when they are less liquid than before? Lastly, is the prudential liquidity plan really just a way for the government to lock in low interest rates? By selling low coupon debt to the BoC and holding it there interest free (all BoC profits flow back to the government), the government avoids the necessity of having to issue long term debt at potentially higher interest rates in the future. Do the BoC and Finance Department know something that we don’t – that they expect to be raising rates soon? Mr. SPENCE. I assume the reason the authority was repealed in 1935 was because of the existing conditions, then, when there was no reason for the authority: is that correct? the more futures contracts the funds want to hold, the more risk the counterparties who short the contract are exposed to. According to the model, the futures price must be bid high enough to compensate the short side for absorbing the risk. This compensation comes in the form of an expected profit to the short side of the futures contract. ...isn't this an attempt to prove a version of Keynes's theory of normal backwardation? Here is Keynes: "If supply and demand are balanced, the spot price must exceed the forward price by the amount which the producer is ready to sacrifice in order to hedge himself, ie. to avoid the risk of price fluctuations during his productions period." Keynes wrote that speculators would require a premium if they were to bear the risk of price movements. In a way, it seems you are substituting Keynes's hedgers with a more modern sort of naive indexer from whom speculators demand an extra return. Unfortunately Hamilton did not find the data to back up his hypothesis. Too bad, it is a very elegant theory. Stephen Williamson has been thumping the drum on the irrelevance of quantitative easing for some time now. See here, here, here, here, here, here. I jumped into the comments of his most recent on this issue, and have done so here and here as well in the past. I've had problems squaring Steve's irrelevance theory with the very real fact that in the day-to-day drama of financial markets, traders with large portfolios think QE is very relevant. Because they are large traders, and because they think it is relevant, quantitative easing IS relevant. One way to square this is to conclude that both Steve and the markets are right, but it depends on how you approach the problem. I learnt some interesting facts about inflation-linked investment products. To begin with Sober Look had an intriguing chart showing an inversion in the TIPS yield curve. Michael Ashton at Epiphany had an interesting explanation for this. Basically, short-dated TIPS begin to trade like gasoline futures. Like zero-coupon inflation swaps, TIPS are indexed to headline inflation, not core inflation. The most volatile component of headline inflation are gas prices, although in general large changes in gasoline prices will mean-revert to core inflation. We've had a large fall in gas prices, so near TIPS have fallen in value. More distant TIPS price in an expectation of gasoline reverting to core, and therefore are less sensitive to the fall in gas prices. Michael explains here why inflation swaps are a better indication of true inflation than TIPS. I learn here that the 5Y 5Y forward inflation curve is the market price for an inflation swap that starts in 5years and ends in 10 years. 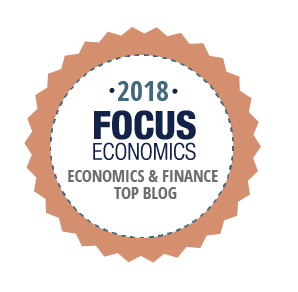 In this post at David Glasner's blog, I point out that the fall in TIPS prices might not necessarily be a negative indicator. Starting with Michael's point about the sensitivity of near TIPS to gasoline prices, how much of the fall in gasoline prices is linked to fears of deflation, and how much to the massive rise in crude oil inventories coursing through North America? Domestic crude oil production is skyrocketing due to the technical combination of horizontal drilling and multiple stage fracturing. If this technological leap has contributed to the fall in energy prices, and the fall in energy prices has contributed to the fall in TIPS prices, then there is some component of ingenuity, and not wholly pessimism, at the core of the fall in TIPS prices. John Cochrane has had a few interesting comments on Greece leaving the Euro, here, here, and here. Cochrane doesn't believe in the consensus view that a Greek default means a Greek euro-exit. He thinks Greece can default and stay in the Euro. He also makes the good point that Eurobonds already exist... in the form of Target2 transfers. His last post illustrates how difficult it would be to create a new drachma. I am sympathetic to many of his views. I had an interesting debate in the comments section of his last post on the difficulties of creating a new drachma. A few comments at MMT blogs on the subject of consolidating the nation's central bank and its treasury. This argument could probably go on forever, but it is an interesting one. MMT's "general case" is one in which there is a government and at some sub-level a treasury and central bank. The government reigns supreme as a currency issuer since it consolidates both institutions. I don't know why this setup must be the "general case" and everything else anomalous. Why not call an independent central bank and a non-issuing treasury the "general case" and then reason from there? It seems ad hoc to me. I prefer thinking not in terms of hierarchies, nor in some sort of tiered progressions away from the general case, but in terms of poles. At one extreme is a totally independent central bank, at the other is a totally consolidated central bank. In the real world, every institutional setup lies somewhere in between. This reminds me of an old argument I had back in 2010 at WCI.